Rumpke Consolidated Companies, Inc. owns and manages the largest landfill in Greater Cincinnati. 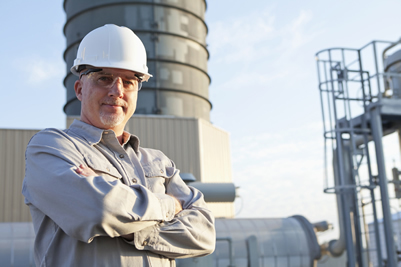 Landfill operations include an automated waste water discharge system that pumps waste water from containment cells. This system pumps the waste water through a 5,000 foot pipe routed through the woods and under a public roadway. After routine maintenance, solids from inside the pipe became dislodged completely blocking the waste water system. There was not enough time to clear the pipe blockage, nor to determine the clog location to set up a by-pass. Rumpke did not have adequate lengths of contingency pipe to assemble alternative drainage on site. Leaving no other option but to shut down the system until assistance arrived, a decision that required a significant amount of contingency storage. To save time, we decided to bypass the entire 5,000 feet of pipe versus spending time attempting to locate the clogged section. Allied loaded trucks and trailers with pipe in 20 ft. increments and dropped them along the bypass route. Seven, Allied technicians worked non-stop for several hours throughout the night and into the early morning to connect sections of pipe through the woods and under the road. They had the waste water flowing again in 8 short hours. Normal discharge flow rates were restored. All personnel stayed until the job was finished. 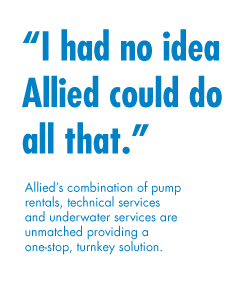 Allied’s timely and accurate response in the middle of the night allowed Rumpke to remain to maintain compliance and ensure uninterrupted operations the following day.